Showing results for tags 'compressor'. Maytag RSD22A Bad relay ? Hello all, I have a Maytag RSD22A, compressor won't start. Resistance values ok on all 3 pins. Can I check the relay and compressor by connecting 110V directly to the start pin, or is there a better way? Just pulled this one out of storage after 6 months - compressor and condenser fan will not run - evap fan running full speed. Has had "no cooling" issues in the past - but always seems to fix itself after a day or two. Not this time - just plugged it in - and nothing happening. I suspect the wonderful dual digital display control board (@ $150 - Ouch) but I'm going to check for voltage at the condenser fan and at the compressor start relay - before I spend $$$ on a new control board. Any other things to check? Condenser coil is clean enough - and I would think the compressor would start up in any case from a dead warm siesta. 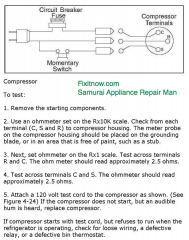 Compressor doesn't even try to start - no clicks, no nuthin... Frigidaire/Electrolux Side by Side manf 10/2007 Thanks !!! Hello everyone. 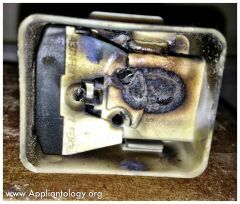 My Kenmore refrigerator began to make clicking noises three weeks ago after a power outage. I have replaced the relay twice with new ones. Replaced the cold control because it was going bad. Replaced the defrost board. Refrigerator is still clicking every 3-4 minutes, lights inside dim. The model number is 106.51103.10. It is only four years old. Capacitor checks OK. The readings that I am getting from the compressor are from the two bottom prongs: (8.5) from the common to the other prongs. (3.0) and (5.7). What should I do next? Is the compressor a goner? Thank you.